One of the smallest nations on the planet, Niue delivers a big Pacific experience that's unlike any other. An easy flight from Auckland, this island is a destination for tropical explorers who love being in the water, discovering amazing landforms, watching whales and enjoying honest South Pacific cuisine. Air New Zealand is proud to be Niue's number one link with the world. We fly non-stop to Niue from Auckland twice a week. Connections across our domestic network, including Wellington and Christchurch, make it easy to access flights to Niue from anywhere in New Zealand. When planning Niue holidays, you need to be aware of the dateline effect. If you leave Auckland on a Saturday, you'll arrive in Niue on Friday. Likewise, when you leave Niue on a Friday, you arrive in Auckland on a Saturday. On Niue you can often see humpback whales from land, which means your morning coffee at a cliff's edge café could include a free whale tail slapping demonstration. Flight time from Auckland to Niue is around three and a half hours (210 minutes) and you have a choice of four fare types - Seat, Seat + Bag, The Works and Works Deluxe. All fares include an on-demand seatback entertainment system. More about seats to suit. If you're interested in cheap flights to Niue from Auckland, you can sign up for our newsletter to receive regular updates about fares, packages, competitions and exclusive offers. It's also possible to assemble Niue holiday packages on our site. During the fare booking process, you have the option of adding a rental car. After paying for your tickets to Niue, you will be offered the chance to book accommodation through Expedia. Niue Airport, also known as Hanan International Airport, is just five minutes' drive from the main town of Alofi and most accommodation options, including the Scenic Matavai Resort near Avatele village. Because Niue doesn't have a public transport system, visitors usually hire a car, scooter or bikes for island exploration. A coastal route and cross-island roads from Alofi to Lakepa, Liku and Hakupu make it easy to explore the island's many attractions. 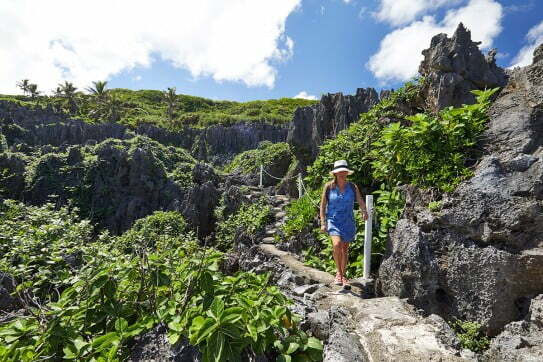 There's nowhere in the Pacific quite like Niue. 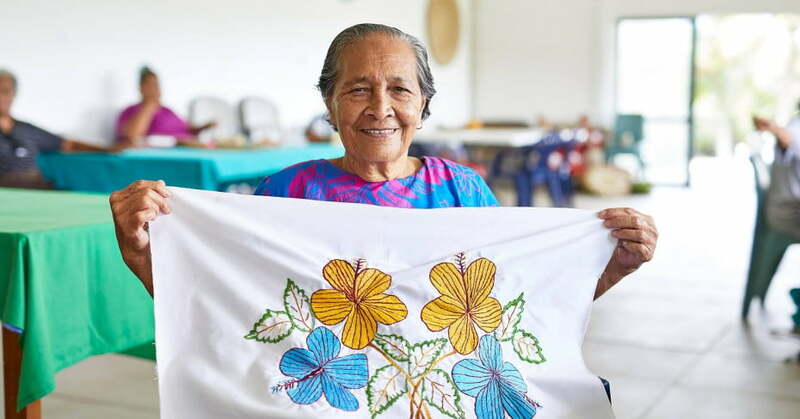 It has some things in common with other islands, such as coconut palms and a wonderful tropical climate, but it's made differently. The entire island is a raised coral atoll sitting on top of an ancient marine volcano. For you this means accommodation with gorgeous cliff top views and water fun in an ocean that's crystal clear, because there's no sediment to cloud it up. Niue has some of the most remarkable snorkelling spots you've ever seen, including Limu Pools, Utoko Beach, Tautu Reef and Hio Beach. Matapa Chasm, near Hikutavake, is one of the best places to go in Niue for a dip. It was once a swimming pool for royalty, as was the spectacular Avaiki Cave at Makefu. You don't need a boat to access these places - just walk down a track or staircase to the ocean's edge and there they are, complete with living coral and masses of bright-coloured fish. If you're a scuba diver, you'll rave about the visibility in Niue's waters - up to 80 metres! 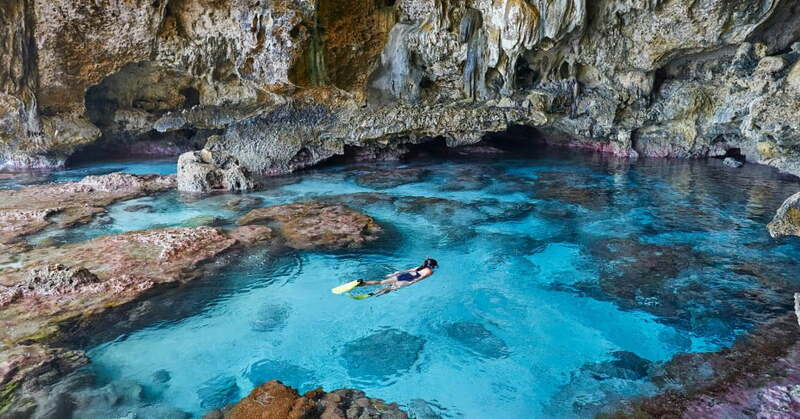 Along with incredible water clarity, Niue offers amazing cave and cavern diving. There are some spectacular hard coral reefs, too. From July to October humpback whales live in the seas around Niue. They migrate from Antarctica each year to give birth and nurse their young. You can often see the whales from land, which means your morning coffee at a cliff's edge café could include a free whale tail slapping demonstration. If you dine on the outside terrace at the Matavai Resort, there's every chance you'll see a whale performance from your table. There are several tour operators offering whale watching trips and the possibility of in-water whale encounters. Niue is one of the few places in the world where, if the conditions are right, you can swim with humpback whales. Coral rock is limestone, and where there's limestone you'll find caves embellished with extraordinary formations. Niue's easily-accessed caves offer stalagmites and stalactites with a view of the ocean. At the Talava Arches, the waves are almost in the cave with you! You won't pay admission; Niue's caves are free to see. Chasm adventures are another Niue specialty. 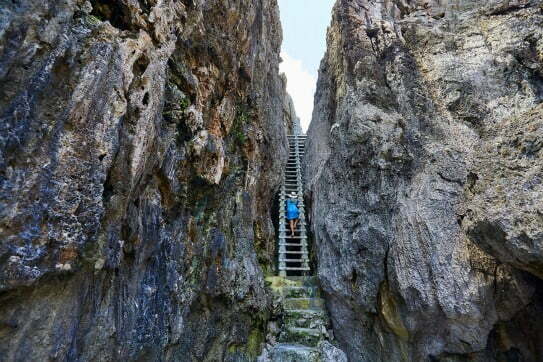 These usually start with a hike through the forest and finish with a long ladder or staircase down a cleft in the rock. At the bottom you could find a lost world or a magical pool - each chasm is unique and the photography opportunities are epic. For leisurely riding, there are bikes for hire locally. The road system that circles and crosses the island is bike-friendly, because cars travel slowly. There's also an extensive network of off-road tracks through the forest, which will take you to places cars can't reach. The highest point of the island is just 68 metres above sea level, so hills aren't a big deal. Fishing magazines call Niue the 'fisherman's secret paradise', because you can get to deep water very quickly. In that deep water there are marlin, tuna, mahimahi, sailfish, wahoo and giant trevally (known as GTs in the fishing world). There are several local fishing operators ready to zoom you out for an exciting day on the ocean. Local charter policy prevails that the catch stays with the boat, however you can usually claim a piece of the catch for your dinner. When you're driving around on Niue, everyone waves. It's that sort of island. The locals are super-friendly and helpful - they genuinely want you to have an amazing holiday. This level of care is noticeable in the tidy presentation of the accommodation, which ranges from a resort hotel to backpacker hostels and a multitude of private holiday cottages. The best restaurants in Niue have a seafood and tropical fruit focus, as you'd expect, but they also feature quality ingredients imported from New Zealand. Be sure to try ota, Pacific fish marinated in lime, coconut cream, chilli and fresh herbs. The most popular time of the year to visit Niue is July to October, when the humpback whales are visiting. April, May and June are also a good pick, because temperatures are comfortable (average temperature 24°C) and might be able to choose some of our best flight deals to Niue. If you love tropical heat and want to see Niue when relatively few tourists are visiting, consider the summer months from November to March (average temperature 27°C). Niue is a cost-effective place for a holiday. Many of the attractions are free and there aren't a lot of shopping opportunities. Restaurants range from cheap and cheerful cafes to a highly-reviewed Japanese restaurant and the upmarket Dolphin at the Matavai. Although many food items are imported, prices at the local supermarket are reasonable. Visitors should be up-to-date with routine vaccinations, including tetanus. Vaccinations for hepatitis A and typhoid should be considered. To decrease the risk of catching dengue fever, chikungunya or Zika virus, mosquito nets and repellents are recommended. No visa is required to enter Niue if you're staying less than 30 days, provided you have return or onward tickets (for flights from Niue to Auckland) and sufficient funds for your stay.